We here at The Flower Pot were proud to be involved with the Women’s Tour of this years Rogers Cup Tennis Tournament. 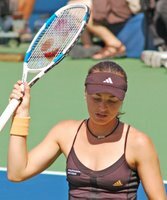 It was held between August 12 -20, 2006 at the Uniprix Stadium, Jarry Park, Montreal, Quebec, Canada. 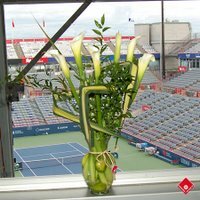 For nearly 15 years, we have been decorating the site of the Uniprix Stadium in Jarry park with our green & flowering plants, and floral arrangements for the Rogers Cup Tournament. This year we were responsible for the Women’s Sony Eriksson Open. With this post, we hope to give you a glimpse of our involvement. We decorated the stadium with over 300 green & flowering plants including tropical red hibiscus, yellow pouprier, skyblue scaveoles, bright red shrimp plants as well as ficus benjaminas and trailing sprengeri ferns. Our designers also prepared over 350 floral arrangements ranging from a single floating gerbera in a clear glass bowl to elaborate center pieces and large buffet pieces. 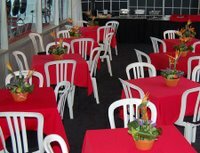 These arrangements were made primarily for over 40 corporate clients to decorate their suites. In the images below, you will see arrangements made of Birds of Paradise for the Banque Nationale Suite and rose arrangements for the Casino Montreal suite. Besides our arrangements, there were also over 30 different vases to grace the dining tables. White and burgundy dendrobium orchids; large cymbidium orchids in green, gold and white; birds of paradise; many kinds of lilies; different colored gerberas; eremerus; alstromerias; lisianthus; larkspur; sunflowers; exotic gingers; blue delphiniums; Bells of Ireland; multi colored roses; snapdragons; waxflowers; hipericum and more. However, despite this wide range. We were not responsible for all floral arrangements on site. This also meant that there was an abundance of artificial flowers throughout the site prepared by other decorators and designers. Fortunately, most spectators could not tell the difference. It helps having real flowers there to confuse you! 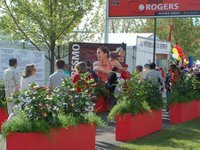 For examples of our work, and arrangements you can order, visit the Rogers Cup section of our website. In order to prepare for the tennis open, we had four designers working at the store to create the arrangements, one driver who ran back and forth with our arrangements, and two at the stadium (Christiane and Tyrone shown below) who worked round the clock to install our plants and flowers, as well as maintain it throughout the week. Our first delivery run was at 6 am on the opening day. Everything had to be ready before the very first spectator arrived. You can imagine the frantic pace at which we had to work. What makes it more difficult is the fact that we were not the only ones prepping. 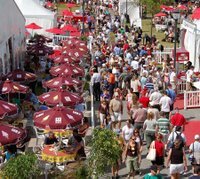 This created an almost chaotic environment where we had to compete for road space, and were often delayed by large trucks blocking our preparation tent located outside of the stadium. When there was time to breathe, there was an opportunity to capture the whole week in pictures. To give a clearer picture of our work and the site, we have for you these images collected throughout the week of the tournament. Be sure to visit our website to view our arrangements, which are available for ordering. Martina Hingis is in shock as she approaches defeat. The winner takes it all! Ana Ivanovic waving in excitement as a camera man tries to take a close-up. She pulled an impressive 6-2, 6-3 win over Martina Hingis. New models from BMW like this one were placed throughout the site of the Uniprix Stadium. 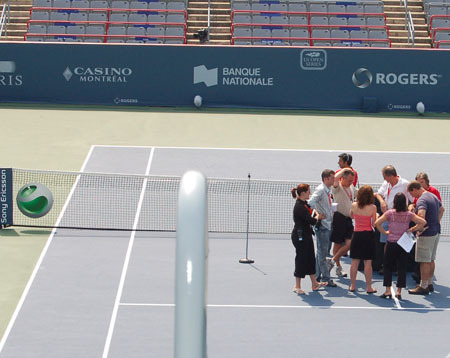 Here we see Rogers Cup volunteers admiring the interior of the M6. 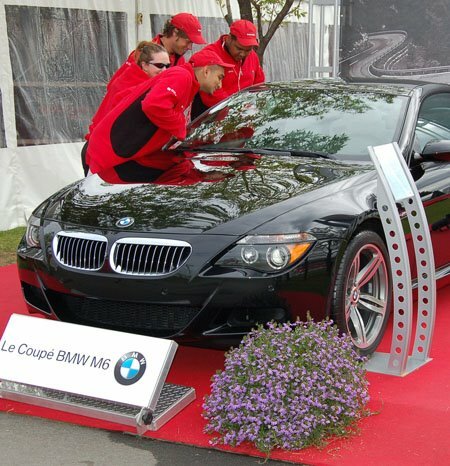 The purple plant in front of the car, skyblue scaveoles, is one of many that we placed throughout to adorn the BMW’s. 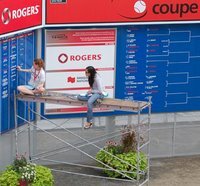 Fans are resting on the wooden ledge of this three dimensional Rogers cup logo. This logo was prepared a week earlier by The Flower Pot. We had to take careful measurements of the 10’ by 10’ garden. Clean debris and rocks, and collect white rocks, and red bricks to create the white frame and red inside that you see. The outer perimeter is lined with pretty white wax begonias. Grand Entrance! 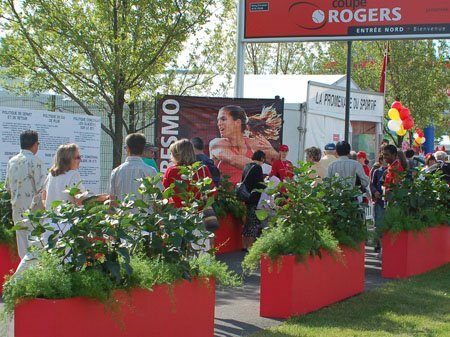 Hibiscus and sprengerii plants were placed in wooden boxes painted in the official Rogers Cup red. These lined the walkway towards all the main entrances. Seen here is the North Gate of Uniprix stadium. Court is in session! Tennis Canada officials are in discussion. About what, we do not know, but it is important enough to take place in the middle of the court. Hunger overtakes! 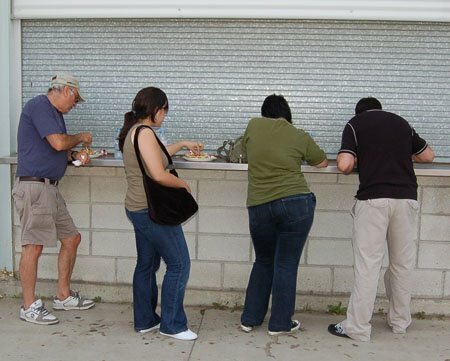 Fans find a place to catch a bite. 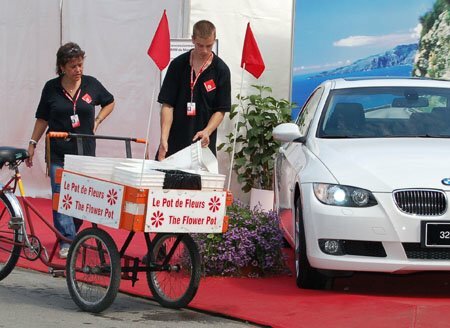 Christiane and Tyrone from The Flower Pot are watering the purple plans adorning the BMW’s. The cute rickshaw is our mobile to carry water loads throughout the site when games were in session. Christiane and Tyrone make sure the sprengerii plants are hydrated. 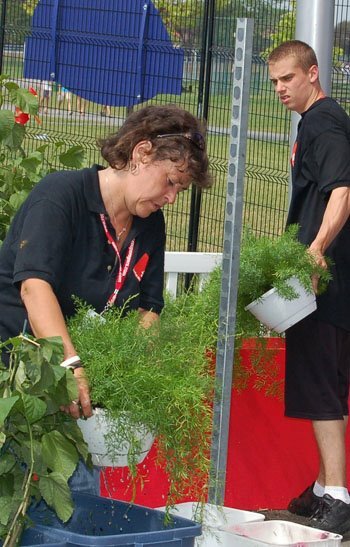 These two had to maintain all our plants and flowers throughout the site during the week. Sports events are emotional! Here is a couple in embrace. Love-40! 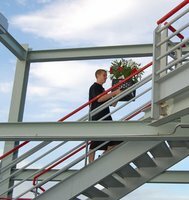 Tyrone carrying some flower arrangements to the upper levels of the Uniprix Stadium. 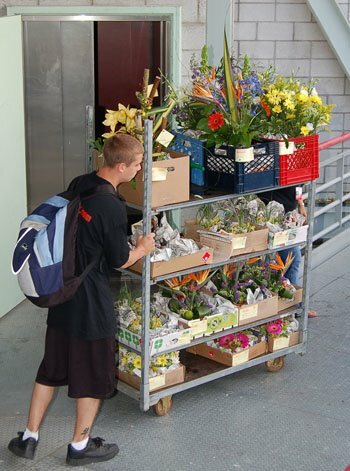 Tyrone is pushing a cart full of our floral arrangements. 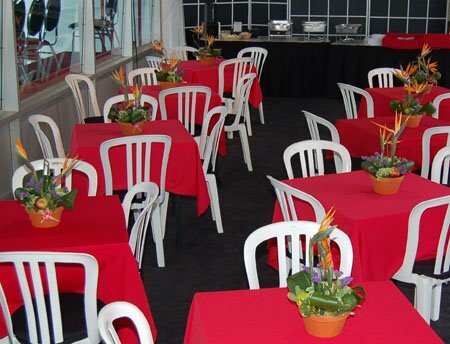 These arrangements were placed throughout the upper VIP decks of the Uniprix Stadium. Parades of volunteers are marching on site. 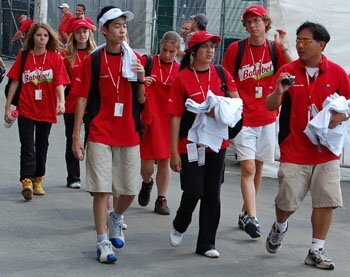 Volunteers like these were essential in making the Rogers Cup tournament a success. Heavy Traffic in the Uniprix Stadium grounds. Fans are parading towards their destinations in between matches. This kind of traffic was common throughout the week. Keeping the score is no easy task. These two Tennis Canada employees are updating the scoreboard. The Banque Nationale VIP tables were adorned with our Birds of Paradise arrangements. 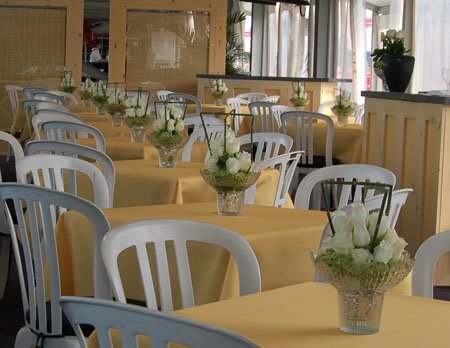 Our Rose Arrangements adorned the yellow VIP tables of the Casino Montreal Suite. White roses nicely complemented the yellow corporate color of the Casino Montreal. 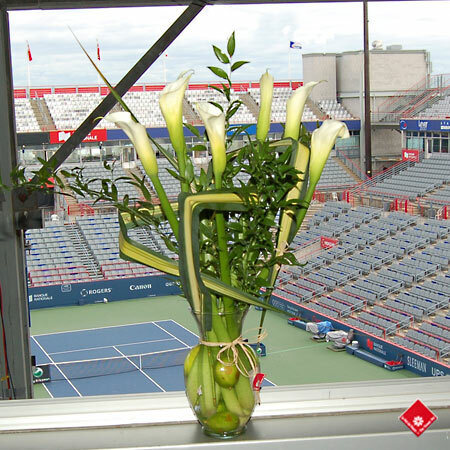 A vase containing calla lilies and pendanous leaves overlooks the Uniprix Stadium at Jarry Park. You can order this vase from our website.